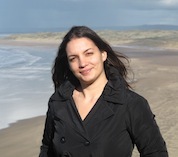 Katerina Douka is an archaeological scientist, specializing in the radiocarbon dating of prehistoric remains. She holds Masters and DPhil degrees from the University of Oxford and has worked in the dating of several Palaeolithic sites around the Mediterranean, from Libya and Lebanon to Italy and Spain. Currently she is a postdoctoral researcher on a project funded by the Leverhulme Trust investigating the Ancient Human Occupation of Britain.